25 Litres capacity, led display, preset function cooking and signals, microwave+grill+convection. Signoracare 25 L (Black) 25 Litres capacity, led display, preset function cooking and signals, microwave+grill+convection. This signoracare microwave oven with convection and grill 25 litres capacity. It has 25 cooking modes with Preset Function cooking and signals. 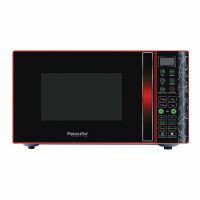 This microwave comes with 1-touch cooking options including settings for popcorn, potatoes, pizza ,beverages and frozen dinners. The microwaves cook-by-weight and defrost-by-weight functions helps make It easy to prepare a wide variety of foods. To Recieve updates and possible rewards for SignoraCare SC-2511-CG please sign in. To Recieve updates and possible rewards for Microwave please sign in.